Paul Gratz, the owner of Gratz Gallery & Conservation Studio in Doylestown, personally supervised the restoration of the mural. 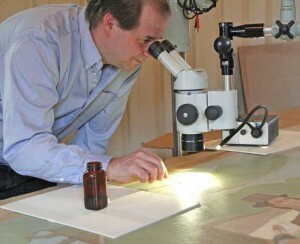 Here he inspects details with a microscope. WEST CHESTER — The degrees of separation of Chester County residents from art and literary cognoscenti decreased yesterday afternoon with the return of a 5- by 16-foot Edward Shenton mural to public display after a painstaking restoration. A program hosted by Senior Judge Thomas G. Gavin culminated with the unveiling of the large work, which focuses on the history of justice in Chester County. It can be viewed in Courtroom Two of the Justice Center in the 200 block of West Market Street in West Chester. Previously, the mural graced a wall in Courtroom Five of the historic courthouse. Gavin said it was commissioned when the courthouse’s North Wing was constructed in the mid-1950s, and it hung in the courtroom of Judge J. Paul MacElree, whose grandson, James P. MacElree 2nd, is the current president judge. The former commissioners sought input from a committee of art experts headed by John W. McCoy Jr. before voting to fund the project. Gavin said he jumped at the chance to move to Courtroom Five when Judge Lawrence E. Wood retired. “When I first saw it, I fell in love with it,” Gavin said of the mural. The mural depicts three groups of figures. A trio of Lenni Lenape Native Americans and a Quaker man highlight the bond between those groups. Three African Americans and a Quaker woman represent the Underground Railroad. And a gathering of diverse citizens in front of the courthouse, superimposed by oversized scales of justice, indicates the importance of the legal system. The background includes county landmarks such as Lukens Steel in Coatesville, the Birmingham Meetinghouse, and Downingtown’s Log House. All three commissioners spoke about the importance of preserving such a significant piece of Chester County history and thanked the multiple people who made it happen. Commissioner Ryan Costello singled out Bill Scott, a West Chester preservationist, for his tenacity in urging the county not to abandon the mural when it sold the building. Shenton, the mural’s creator, first earned acclaim as the illustrator of “The Yearling,” a 1938 novel by Marjorie Kinnan Rawlings, according to a biographical web site. He was born in Pottstown in 1895 and grew up in West Philadelphia. After completing his World War I service in France, he enrolled at the Pennsylvania Academy of Fine Arts, where he won awards that enabled him to study in Paris. When Shenton returned to the U.S., he began a stint in publishing that included writing his own novels and illustrating those of others. A longtime association with Scribner’s and its high-profile editor, Maxwell Perkins, resulted in Shenton’s artwork for F. Scott Fitzgerald’s “Tender is the Night,” Ernest Hemingway’s “Green Hills of Africa,” and works by Thomas Wolfe and William Faulkner. Shenton died in 1977. The task of continuing Shenton’s legacy in Chester County went to Paul Gratz, the owner of Gratz Gallery & Conservation Studio in Doylestown. He said he was delighted the commissioners decided to preserve the work, a procedure complicated by the fact that the mural’s canvas was affixed to a plaster wall and had endured years of dirt and deterioration. Gratz said the mural had to be faced with Japanese tissue paper and coated with a solution to stabilize the paint so that it would not flake from the canvas during the slow chore of detaching it from the wall with a scalpel. Back at the studio, bits of glue and plaster had to be carefully scraped from the canvas so it could be re-lined, a prelude to cleaning it with cotton swabs dipped in various solvents, he said. Finally, working to match Shenton’s style and pigments, conservators filled in areas of paint loss over a coat of varnish so that the old and new paint would not mix, he said. Rebecca Brain, a county spokeswoman, said Gratz agreed to charge half of the going rate – $23,000 – for the conservation work. Costello said the original cost of the mural was budgeted at $400 to $500. He joked that like many government projections, the actual price came in higher: $557. Gavin, who has enjoyed discussing the mural with visitors to his courtroom, said he was trying to locate members of the art committee formed in 1955 or any contemporaneous writings about the project to compile a booklet on the mural’s history. He said he’d always been “intrigued by the cloud that hangs over the scales of justice” and inspired by the notion of “justice for all” that the mural promotes. Words to that effect that appeared on the bottom of the original canvas will be added later, he said. MacElree, who could not attend yesterday’s unveiling, sent a letter that was read by Judge Anthony A. Sarcione. In it, MacElree expressed appreciation to the people who contributed to the mural’s successful rejuvenation and relocation. He said the mural’s history was particularly significant to him because of his grandfather’s involvement. “If he were alive today, I have no doubt he would be pleased and proud…,” the judge wrote.